“Passfaces was so unique and we felt our client base would find it very much “cutting edge”. We wanted something exciting; something different that had security second to none. It excited our folks internally and I knew it would excite our client base as well,” said Tom Leib, Product Manager, R.C. Olmstead. Buckeye State Credit Union needed a strong authentication technology to enhance existing security initiatives for their online banking offering and wanted to meet FFIEC guidance requirements. After much research and testing, Buckeye State Credit Union decided that the technology that best matched their criteria was Passfaces. It is the only solution they found that offered bidirectional authentication-meaning it authenticated both the site and the user through a GUI interface, and took any possible burden off of their members. Rollout was planned by year end 2006 to meet the FFIEC guidance deadline. The solution meets a major, geographically dispersed organization’s requirement for strong authentication security and high usability for reliable access to email from anywhere. A large, security conscious organization identified a requirement to provide a secure method for email access from any World Wide Web location for their user community. The IT support organization realized that any outward facing web site that could be linked to this organization would be a prime target for hackers as evidenced by persistent attacks on their existing web site. With this new web service providing access to highly sensitive and confidential information, finding a very robust security solution was a given. In addition, it was required that this security should be achieved without any compromise of user convenience or system reliability. The target security solution defined by the IT staff was an SSL VPN underpinned by strong user authentication. After an evaluation of several SSL VPN providers, the customer selected Netscreen’s Neoteris IVE platform as their application security gateway solution. This decision was made in large part because of the flexible authentication architecture offered by the IVE. A number of possible authentication methods – so-called “strong passwords”, tokens, and biometrics – were considered and rejected for reasons of poor security, usability and reliability. Following an extensive evaluation, Passfaces™ for Web Services product was chosen to provide strong authentication for users coming in to the IVE. The Passfaces and Netscreen team quickly developed an integrated solution whereby a custom web interface, provided by Passfaces and accessible via Microsoft’s Internet Information Server, sits in front of the Netscreen IVE box collecting the users’ credentials and, after verification, enables initialization of the SSL VPN connection. Being Web-based, the solution requires no client software installation and can be deployed and scaled extremely rapidly across any size user population. Following demonstrations of the solution and initial testing by the customer, the integrated system was implemented in a pilot deployment project. The pilot solution met performance criteria and was well received by the user community. The system is now extensively deployed across the organization. CBI has integrated patented Passfaces cognometric authentication technology into SafeBoot® solutions, offering customers the option of reinforcing traditional passwords and PINs with a strong, secondary authentication solution-or replacing them altogether-on PCs, laptops, tablet PCs, and palmOne™ PDAs. 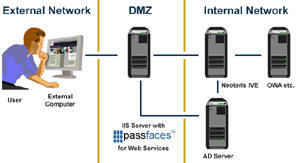 The Passfaces system provides a quantifiable level of additional entropy out of the box for all GUI-enabled systems, ensuring only authorized users gain access to devices that store mission-critical data or are connected to private networks.